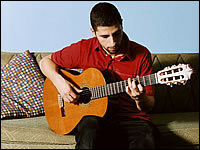 Jose Gonzalez took home the Swedish Government’s Music Export Prize at the 2007 Swedish Grammy Awards. Luckily for US fans González will treat us to a glimpse of forthcoming new material during a brief US tour this spring. As part of the tour, he’ll stop off to play at Coachella on the 29th, so if you have tickets don’t forget to check him out.